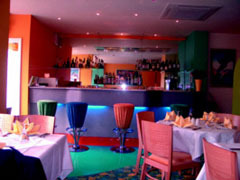 The Elachi restaurant has been modernised to a very high standard. The dining area is relaxed but with sophisticated touches such as the crisp linen, subtle colours and modern interpretation of Indian art. All dishes prepared on the premises, including the sauces, use the freshest of ingredients and the chutneys are made to a very old family recipe. The management of Elachi take great care to ensure that diners are happy with the food and surroundings. Apply for the Elachi membership card for great savings. Elachi can cater for 65 diners at any one time and is available for hire for private functions such as birthdays, anniversaries, Christmas and other special occasions. Outside catering is available upon request. We provide full take-away delivery service within a two mile radius. Free delivery hotline 0800 096 2474. Elachi membership card: Gold and Silver offers: Gold Card: 4 people - two main courses free (lowest cost). Silver Card: 2 people - lowest cost main course free. Buy the card for only �25 - lasts 6 months. Open every day 12-2.30pm and 6-midnight. All major credit cards accepted. No service charge. Live jazz and blues every Thursday evening. .... close your eyes, take a deep breath and inhale the essence of the spices. Now take a mouthful of your favourite dish and slowly enjoy the delicate tastes each dish brings you. I see, I souppse that would have to be the case.